Rocketboom launches its new sponsorship model and gets YouTube, the biggest online video site when it comes to audience share, as its first major sponsor. Andrew Michael Baron, Rocketboom’s founder and video publisher, announced in his blog this new sponsorship model, along with his personal account of the company’s rocky history detailing the site’s financial struggles and successes. With the new sponsorship model, advertisers basically get (1) a 7-seconder post roll sponsorship gratitude with its company logo and byline, (2) company name and link that travels as metadata to most platforms, (3) sponsor blog page with text, graphics, audio & video, and (4) quicktime chapter marker that allows viewers to easily access sponsor message from chapter drop-down box. All these on top of a high-value audience that Rocketboom has accumulated through the years, as well as archived pages that can easily be searched. Cost per episode is at $3000 until Sept. 1 when it raises up to $5000. Startups get discounts. With YouTube as its first major sponsor, Rocketboom does not only get in front of a wide online video market, its videos can now also be easily syndicated, shared, embedded, and commented and subscribed to, through Youtube’s web browser. Apparently, Rocketboom does not have a YouTube account prior to this sponsorship deal. 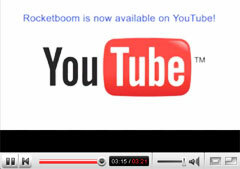 You can view Rocketboom’s YouTube account here, and its new sponsorship package here. …and if you watched the video in its entirety, you should know by now that YouTube is the first sponsor. Meanwhile, Andrew Baron has a post about the new sponsorship model.